By mixing wheat germ, egg whites, and plain yogurt into lean ground turkey meat, I’m able to boost the vitamin E, selenium, and zinc. Together with bell pepper–tomato sauce — rich in vitamin C and beta carotene — it’s a perfect meal for beautiful skin. In a large bowl, mix the wheat germ, egg whites, half the garlic, half the onions, the yogurt, and basil. Add the turkey. Season with salt and pepper and mix well. (The mixture will be sticky.) Cover and place in the freezer 20 minutes, for easier handling. Meanwhile, in a blender or food processor, purée the tomatoes with the water. In a large nonstick skillet, heat 1 tablespoon olive oil over medium-high heat. Sauté the remaining onion and garlic until translucent, 3 to 4 minutes. Add the red pepper, and cook 5 to 6 minutes longer, until the pepper softens slightly. Add the thyme, oregano, and puréed tomatoes, and bring to a low simmer. Roll the turkey mixture into about 20 meatballs, 2 inches in diameter. Coat a nonstick skillet with nonstick oil spray. Add the remaining 1 tablespoon olive oil and heat over high heat. In batches, add the meatballs and sauté until they are browned on all sides, 6 to 7 minutes total. 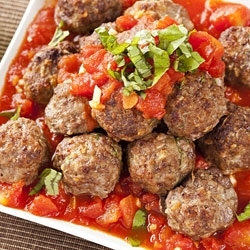 Carefully transfer the meatballs to the tomato sauce as they finish cooking. Simmer, partially covered, about 20 minutes longer, until the meatballs are cooked through. Season with additional salt and pepper. Serve immediately.